New simulations of Earth's asthenosphere find that convective cycling and pressure-driven flow can sometimes cause the planet's most fluid layer of mantle to move even faster than the tectonic plates that ride atop it. That's one conclusion from a new study by Rice University geophysicists who modeled flow in the 100-mile-thick layer of mantle that begins at the base of Earth's tectonic plates, or lithosphere. The study, which is available online in the journal Earth and Planetary Science Letters, takes aim at a much-debated question in geophysics: What drives the movement of Earth's tectonic plates, the 57 interlocking slabs of the lithosphere that slip, grind and bump against one another in a seismic dance that causes earthquakes, builds continents and gradually reshapes the planet's surface every few million years? "Tectonic plates float on top of the asthenosphere, and the leading theory for the past 40 years is that the lithosphere moves independently of the asthenosphere, and the asthenosphere only moves because the plates are dragging it along," said graduate student Alana Semple, lead co-author of the new study. "Detailed observations of the asthenosphere from a Lamont research group returned a more nuanced picture and suggested, among other things, that the asthenosphere has a constant speed at its center but is changing speeds at its top and base, and that it sometimes appears to flow in a different direction than the lithosphere." "We've shown how these situations can occur through a combination of plate- and pressure-driven flow in the asthenosphere," he said. "The key was realizing that a theory developed by former Rice postdoc Tobias Höink had the potential to explain the Lamont observations if a more accurate representation of the asthenosphere's viscosity was allowed for. Alana's numerical simulations incorporated that type of viscosity and showed that the modified model could explain the new observations. In the process, this offered a new way of thinking about the relationship between the lithosphere and asthenosphere." 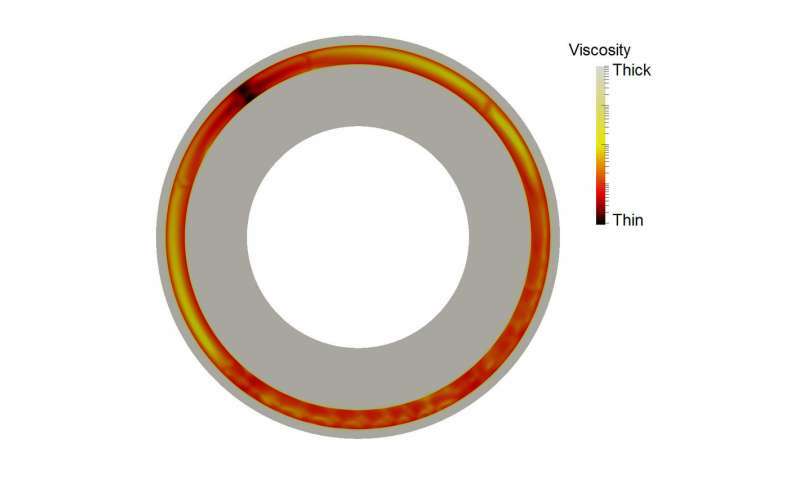 "Thermal convection in Earth's mantle generates dynamic pressure variations," Semple said. "The weakness of the asthenosphere, relative to tectonic plates above, allows it to respond differently to the pressure variations. Our models show how this can lead to asthenosphere velocities that exceed those of plates above. The models also show how flow in the asthenosphere can be offset from that of plates, in line with the observations from the Lamont group"
The oceanic lithosphere is formed at mid-ocean ridges and flows toward subduction zones where one tectonic plate slides beneath another. In the process, the lithosphere cools and heat from Earth's interior is transferred to its surface. Subduction recycles cooler lithospheric material into the mantle, and the cooling currents flow back into the deep interior. Semple's 3-D model simulates both this convective cycle and the asthenosphere. She credited Rice's Center for Research Computing (CRC) for its help running simulations—some of which took as long as six weeks—on Rice's DAVinCI supercomputer. "Our paper suggests that pressure-driven flow in the asthenosphere can contribute to the motion of tectonic plates by dragging plates along with it," she said. "A notable contribution does come from 'slab-pull,' a gravity-driven process that pulls plates toward subduction zones. Slab-pull can still be the dominant process that moves plates, but our models show that asthenosphere flow provides a more significant contribution to plate movement than previously thought."